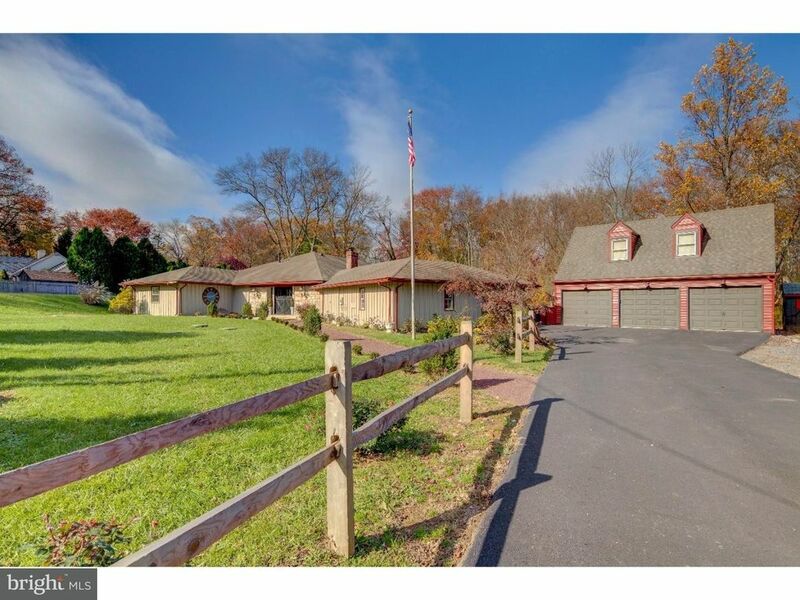 Don't miss this totally updated 3 BD, 3/1 BA home in the prestigious Radnor Hunt area of Willistown Township. Nestled in a quiet neighborhood, with no thru-traffic, this one-story home exudes Carriage House style charm, yet features new bathrooms, new kitchen, and a sought-after, open concept floor plan. Vintage wood double entrance doors lead to the Living Room, which has a fireplace, built-ins, and a large closet. The Dining Room area is totally open to the Living Room, as well as to the Kitchen, and features glass doors to the rear deck. New grey cabinets, quartz counters, a large island with breakfast bar seating, new appliances, and charming light fixtures are found in the renovated Kitchen. Sunlight floods the vaulted Family Room through glass doors and a large Palladian window. A renovated Master Bathroom, Office/Sitting Room, and two spacious closet areas highlight the Master Bedroom Suite. The 2nd Bedroom is unusually large and features 3 closets and easy access to the nearby, totally renovated Hall Bathroom. The spacious rear entrance hall feels too large and nice to just be called a mudroom! It features new Washer/Dryer, laundry tub, built-in shelving, and a utility closet. The updated Powder Room, with pedestal sink and grass-cloth wallpaper, is located in this area. On the far side of this room is the surprising large 3rd Bedroom ? which could easily be used as an in-law suite, guest suite, recreation room, or home office. This room also has a renovated full Bathroom, plus glass doors to the driveway area. You'll love entertaining both inside and out, on the large deck which offers fabulous views of the tranquil 2+ acre property. A shallow creek meanders through the rear yard, and a foot bridge leads to additional grassy lawn, a fire pit area, and natural woods which have been preserved for privacy. Ample parking is available in the extra-wide driveway and detached 3-car garage. The 2nd floor of the Garage offers a walk-up large unfinished bonus room ? ideal for storage, or for finishing into art studio, workshop, recreation room, or exercise room. Systems include newer multi-zone HVAC systems, gas heat, and a newer (recently inspected) septic system. Located on popular Laurel Circle, this Malvern home is convenient to shopping, airport, and Main Line amenities like shopping & restaurants. The Paoli train station, with express service to Center City & NYC, is just minutes away. By appointment only.